Successful Project Management is accomplished through the thoughtfully balanced application of leadership art and science. There are many excellent resources available for those seeking to improve their leadership science competencies. However, few experienced-based resources are available for those seeking to improve their project leadership art competencies. For some time now, I’ve been exploring the idea of using W. Edward Deming’s System of Profound Knowledge (SoPK) as a thinking framework to provide such a resource for Project Managers (PM’s). In this blog-post I’ll share an overview of the results of that exploration to date. Deming’s SoPK is a leadership competency framework consisting of four interdependent and synergistic elements: Appreciation for a System, Understanding Variation, A Theory of Knowledge, and Psychology. I’ve used these SoPK elements, in a project management context to develop what I believe are some powerful leadership art competency insights, project managers can use to enhance their success. The graphic used at the beginning of this post depicts the SoPK elements and my visualization of their interdependencies. Although no model is perfect, I’ve found this one to be useful as a guide for my thinking exploration and as a framework for documenting my observations and ideas. • Projects are systems of people connected to other people for the purpose of achieving a singular objective. You can’t use mechanical thinking to lead an organic system. This means that the PM’s job is as much, or maybe even more about managing the relationships between the people in the project than managing the “stuff” of the project. • Project system connections always extend beyond what you typically initially consider in your planning, communication and control thinking. – Your customers have customers who have agendas, demands and pain thresholds you must know about. – If your project is in a business managed using a matrix organization, you have critical matrix connection obligations and risks to consider. – Conventional project leadership science approaches cal for PM’s to keep their heads down and focus on their projects. Leadership art demand demands that you keep your head up and on a swivel to be aware of everything going on around you. • Focusing on special cause versus common cause, or “natural” variability. • The PM’s role is a Knowledge Manager who executes the project across the knowledge domain. From the “Known-Knowns”, which form the foundation of the Project Plan, to the “Known-Unknowns” which are the project risks, to the Unknown-Knowns which are accommodated by buffers and reserves. • Encouraging and fostering a “learning environment” for the project team that may find and avoid “Unknown-Unknowns” and reveal and exploit opportunities. • The most important competency for a leader is social/emotional intelligence. The ability to sense the mood and motivation of individuals and groups and respond appropriately is critical to project success. • Politics are inherent in any human system, including projects. As distasteful as it may feel for leaders, they must become politically savvy to navigate their project through this environment. • In order to earn the trust and really be able to communicate with those whom you lead, you must be willing share your inner thoughts and feelings. As a project leader, your position alone can enable you to demand the minds and muscle of your team. But if you want them to put their hearts into the project, you must have the courage to make yourself vulnerable. The following graphic is an attempt to bring all of these ideas together. I welcome your comments and ideas for future exploration of this topic. 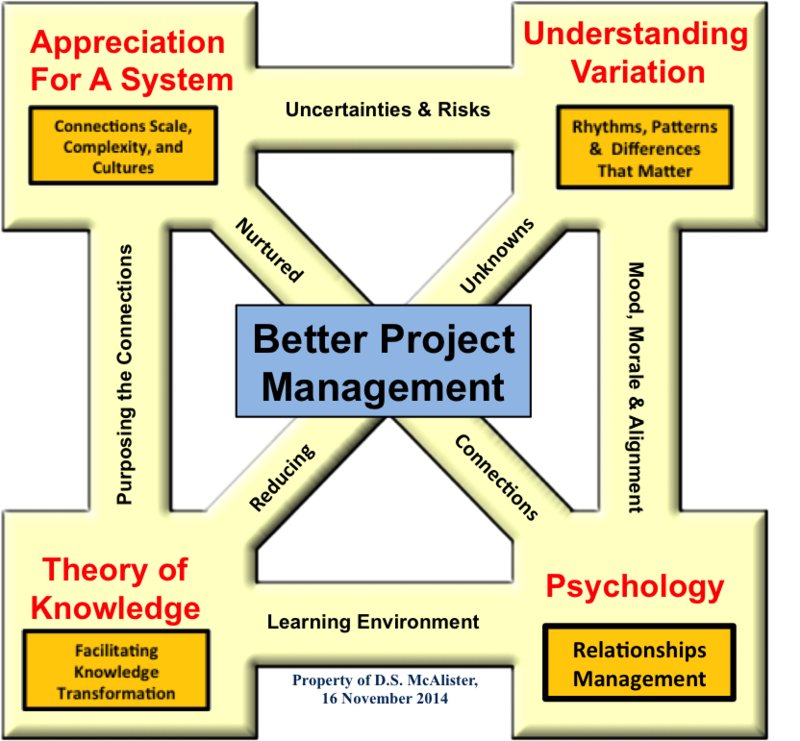 This entry was posted in Better Thinking, Deming's System of Profound knowledge, Leadership, Personal Development, Program & Knowledge Management, Project Management, Uncategorized. Bookmark the permalink. the synthesis of episteme i.e. (in the scenario of my research), a body of ideas based theoretical knowledge, techne i.e. professional and institutional experience and the concept of phronesis defined for my research purpose as practical wisdom. Don – I couldn’t agree more. I think PM can benefit from SoPK and also PDCA. I have also blogged about how Beer’s Viable Systems Model can be used with PM. PM can be a bit inward looking (PRINCE2, APM, PMI) and it’s good to see approaches your yours being suggested. One weakness of SoPK is the system side: I don’t think Deming truly understood system dynamics – that’s where Beer’s VSM can come in handy!